We are delighted that you are interested in celebrating your wedding at The United Church. We look forward to helping you make the service an occasion of joy and reverence, as you publicly pledge your commitment to one another, seeking God’s grace for your life together. Our congregation is happy to make the facilities and services of the church available to those who have an affiliation with United Church’s membership or ministry, as our staff leads you in preparation for this important day. The Christian marriage ceremony is a service of worship, normally conducted within the house of God. Reverence is expected on the part of all present, and the service shall be under the sole direction of the Pastor. Please bring ideas, resources and hopes you have for the service to your first meeting with the Pastor. The date and time of the wedding are scheduled with the Pastor after a phone conversation with one member of the couple. A security deposit of $100 is required at the time a wedding date is reserved. (This deposit will be deducted from your total fees at the time of the service. Please contact the Pastor as soon as possible to begin planning the service and engaging in pre-marital counseling. There will be at least two meetings for premarital counseling. Weddings at United Church will be conducted by the Pastor of this church unless otherwise noted. If you wish to have another pastor assist in the service, please discuss this with our Pastor. Ordinarily, the Lord’s Supper is not served at weddings at United Church. The wedding is approved by the Board through the Worship and Spiritual Life Committee, on the recommendation of the Pastor. Before any couple is joined in marriage, they shall fulfill all the lawful requirements of the state in which the marriage is to be performed. Applications for a marriage license are made through any local municipality. A wedding cannot take place without a license. 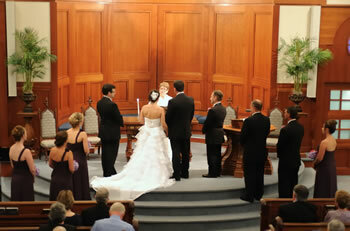 Wedding parties and their service providers may arrive at the church one hour before the start of the wedding ceremony. Wedding parties and their guests will be expected to depart from church space no later than one hour following the conclusion of the wedding service. Please contact Dir. of Music Ministries as soon as possible after confirming your wedding date. The music at your wedding helps express your joy and offers praise and thanksgiving to God for blessing your marriage. Our musician plays at all weddings. Special arrangements may be made at the Director of Music Ministries’ discretion for other organists to play. The DMM remains the coordinator for the music at the service. Please bring your ideas, suggestions and requests for music, hymns, instrumentalists and soloists to your consultation. Only live music is permissible. Most requests appropriate for church services are easily accommodated. The couple may make a traditional departure from the building, showered by symbols of good wishes such as birdseed or bubbles (outside the building). Rice, confetti and released balloons are unsafe and ecologically unsound. They are not to be used. The facilities of the church, including a Fellowship Hall and kitchen, are available for receptions. Separate arrangements, including additional compensation for the wedding sexton, must be made for this. The church does not provide a catering service. The United Church is a smoke-free environment and alcoholic beverages are not permitted on the church premises at any time. The couple identifies an officiant authorized to perform weddings in the State of New York. He/she may be a civil magistrate or a clergy person in a denomination which permits its clergy to preside at same-gender weddings. The name, title and contact information of that person is to be provided to the Pastor at least 6 weeks before the wedding. All arrangements for payment are made directly by the couple with the officiant. If this is a religious service subsequent to a civil marriage, the couple should provide the office with a copy of their marriage license. The couple needs to have completed pre-marital counseling. A letter on letterhead from the person providing the counseling is sufficient documentation. All other guidelines, fees and policies related to weddings apply. The architecture of the sanctuary lends itself to simple floral arrangements. Flowers are to be delivered during hours when the church is unlocked or special arrangements made. Please notify the Administrative Assistant if flowers are to remain for the Sunday worship service. (They will be appreciated, and will announce your marriage to the whole congregation.) Indicate to your florist that no tape, wire or tacks are to be used on the pews. Pipe cleaners are acceptable to attach decorations to the pews, candles, etc. In keeping with the atmosphere of worship, flash pictures may only be taken during the processional and recessional, as well as in the chancel area after the service. Time exposures may be taken from the church balcony and from the narthex door of the sanctuary during the service, with existing light. If you have a program printed, please be sure to include the following note: “Please, no flash photography during the worship service.” Please indicate in advance to the Pastor if you desire her presence for posed pictures following the service. Ask your photographer to contact the officiating Pastor by phone or at least one hour prior to the wedding to clarify appropriate location and timing of photography. A single video tape recording may be made of the service from the balcony. No auxiliary lighting equipment may be used and the equipment may not be moved during the service. We offer wedding services for those who are not members of the congregation as well as those who are. Fees indicated reflect whether or not at least one person being married is an active participant in the life of the congregation. Security Deposit: A $100 deposit is required (check payable to United Church) when your wedding is scheduled, which will be refunded if you need to cancel as long as you do so at least 90 days prior to the wedding date. All fees must be paid by the Tuesday prior to your wedding. Individual checks should be written by name to each staff person. The Administrative Assistant will provide you with the correct names. Checks for room and candle usage should be made out to United Church of Fayetteville.The Marriage License must be received in the church office no later than the Tuesday before the wedding.